DNA marker analysis is widely used in the Japanese Wagyu industry for predicting genetic diseases – one of the most accurate applications of DNA technology. 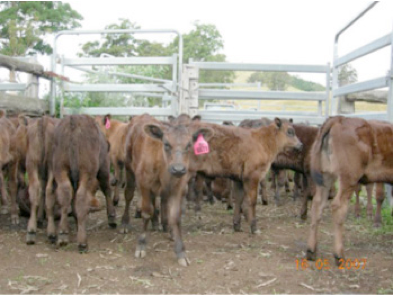 Similar disease tests are now available for Australian Wagyu breeders through NSW (DPI) Industry and Investment’s Elizabeth Macarthur Research Institute in Camden, NSW and through the AWA office. In the context of breed development programs, an excellent snapshot of the general usefulness of gene marker application can be found at ‘Marker Assisted Selection in Cattle‘, University of California, Davis. The recommendation is that marker data should be closely integrated with EPD (or EBV) data and other observed performance indicators. DNA marker tests are seen as an incremental tool, not a replacement. 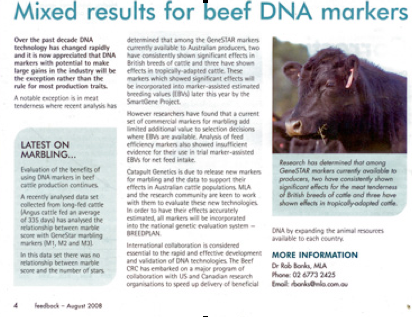 If the early promise of marker technology application in cattle breeding has faded in 2013, but there is little doubt that this genetic research will continue to inform new genomic EBVs, and thereby reduce the complexity of breeder decision making. An illustration of potential complexity is available in DNA Technologies, a chapter from a sire selection text also published by UC, Davis. 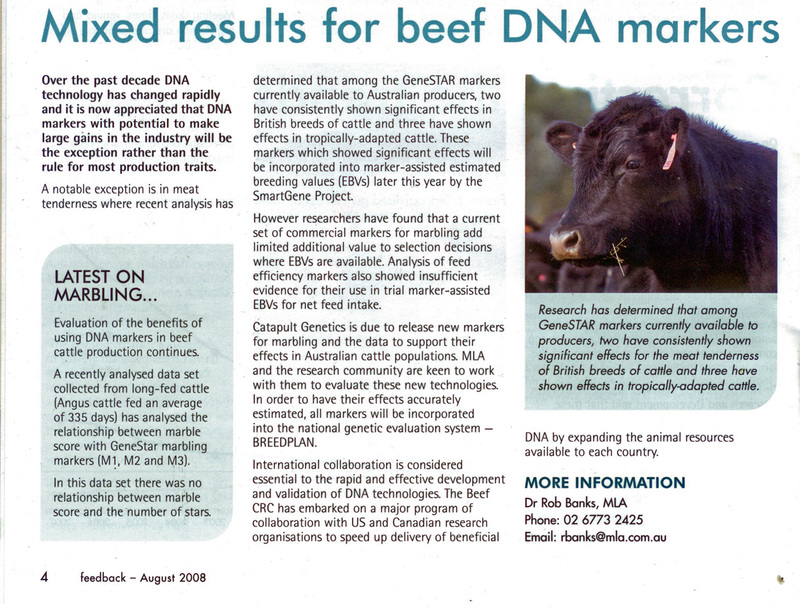 GeneStar , marketed by Pfizer Animal Health, is a world-leading Australian-developed technology for genetic marker assessment in cattle, targeting DNA influencing meat tenderness, marbling and feed efficiency predictors. Previous Australian Beef CRC reviews of Pfizer GeneSTAR technology are available here. Specific to Wagyu, Japan-based Prescribe Genomics offers tests to identify markers influencing growth, marbling, and fat composition.